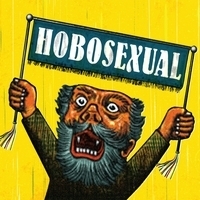 Today's New Band To Burn One To is Hobosexual. First off I'd like to thank The Number of the Blog for writing about these guys. A good choice. Though Hobosexual was formed in 2009, Seattle has loved Ben Harwood’s brand of rock-n-roll for years. Having shred his way through Vindaloo and Iceage Cobra, Ben has landed solidly with Hobosexual. Combining his talents in composition and an undeniable need to feed rock’s fire, Ben creates heavy music that is ambitious and infectious. Unhinged live shows are the key to Hobosexual’s magic. Ben and drummer Jeff Silva are seasoned players worthy the attention they demand. Hobosexual began in a basement with Ben and drummer Matt Ehlers, who left the band in May 2010 after contributing to the self-titled debut CD and playing five shows. Jeff Silva (The Beautiful Mothers, The Second Academy) stepped in and Hobo immediately benefited from his energy, knack for improvisatory feel around an unusually destructive drum beat, and history with Ben. Bandmates in Vindaloo and Gozer, Ben and Jeff quickly lock-stepped in Hobosexual. "The hilariously named Hobosexual's songs aren't funny at all—they're full-on, fuzzed-out classic-rock beasts." "Hobosexual (Ben Harwood and running mate Jeff Silva) have released a self-titled album of mad, scattered, full-frontal rock attack. It's a sound with scurvy, a creaming of fuzzed amplification that builds and fans out. Way out. Think Thin Lizzie and Black Sabbath burning on a pyre of Lincoln Logs. It's a bloodletting of wattage with loping, chunked stacks of heaving guitars. If you're afraid of the rock, don't listen." I'd like to add that vocally they sound a bit like The Suede Brothers. They have a cool mix of bluesy songs, they have some goofy sounding tracks but they fit in well with an almost punk like sound. Really, they need to be heard.